Weekend Intensive and events at the Jane Addams Hull House Museum in Chicago! 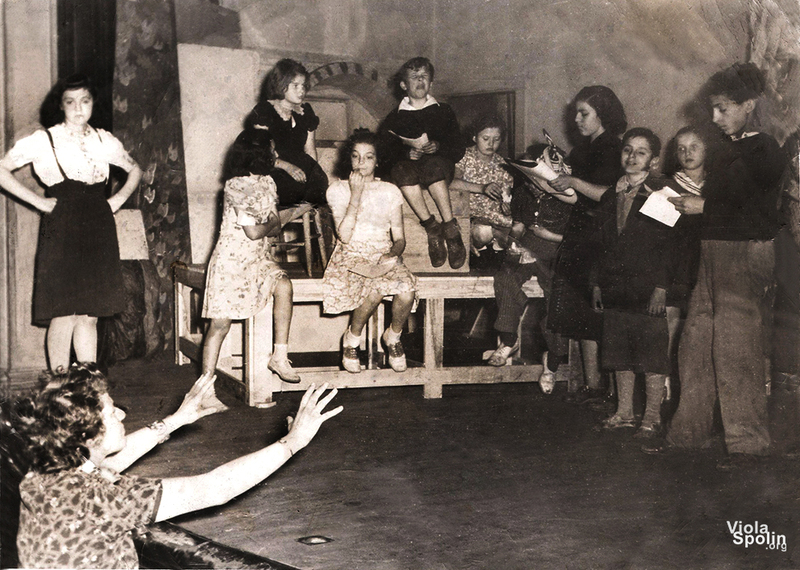 Viola Spolin directing Paul Sills (center, holding script) and student actors on the Hull House Stage, 1930s. Sills/Spolin Theater Works is honored to be returning to the Jane Addams Hull-House Museum in Chicago in May and June for several exciting events, including free workshops, a tribute to Spolin and Sills, and a weekend intensive workshop. We are delighted to bring the work back to its birthplace. We’ll be there on May 13th and 14th for a three events that are open the public and free with RSVP. Info will be available soon here. Hull House will also be hosting an event to honor Viola Spolin and Paul Sills' contributions to American theater on the evening of June 20th, 6-9pm. Save the date and stay tuned for details. Sidecoach Aretha Sills is offering a weekend Spolin improvisation intensive in the historic dining hall at Hull House on June 22nd and 23rd. We will play Viola Spolin's theater games in the space where FDR, Jane Addams, Ellen Gates Starr, and Neva Boyd broke bread. The intensive includes ten hours of play in two days. Beginners and experienced players welcome. Learn more and register here. Enter the holiday season refreshed and inspired! In this three-hour workshop, we’ll explore the theater games and exercises that inspire theatrical improvisers to get out of the head and into the present time, but without any expectation of performing or being “on.” Our goal is to experience the many benefits of spontaneity and group play, with no pressure to create scenes or act. We’ll play a combination of meditative warm ups, sensory-awareness exercises, and traditional children’s games to release the intuition and open up new avenues of personal expression and communication. No experience needed, just a willingness to play! Tuition: $60. for new players, $50 for returning players. A few sliding-scale spots are still available. Tuition is refundable minus a $10 registration fee if you cancel by Nov 1. Registration: Wait list only. Email with questions or for a spot on the wait list. We’ll meet: Saturday and Sunday, Jan 12 & 13, from 11am to 5pm each day, with an hour break for lunch at 2pm. Tuition: $250. A few sliding-scale spots are available. Payment plans ok. Tuition is refundable minus a $50 registration fee if you cancel by Dec 12. This workshop is open to beginners and experienced players. 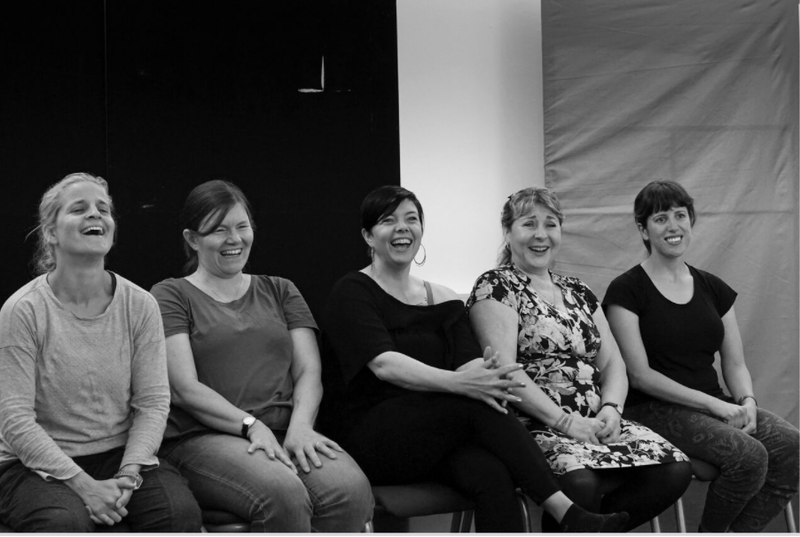 Actors, educators, directors, and improvisers learn through play how to incorporate Viola Spolin's transformative techniques into their practice. The workshop will introduce players to the the key principles of Spolin's revolutionary acting, directing, and teaching methods, and help them be more fully present onstage and off. We'll meet: Tuesday Nights, Jan 15 - March 5, 2019, 7:30 - 10pm. Tuition: $365. ; Returning players rate is $330. A few sliding scale spaces available. Please ask if you need a payment plan. Tuition is refundable minus a $50 registration fee if you cancel by Dec 15. This 8-week workshop is designed to jump start new written work in a playful and non-competitive environment. Writers will learn the fundamentals of scene improvisation and put them to work in their writing through in-class games and writing exercises. We'll clear creative blocks by igniting an intuitive response, and allow ourselves the chance to see where it leads without judgment. The workshop will explore ways writers can access their intuition through play to bring a fresh spontaneity to all types of written work. Open to beginners and experienced writers and players. We'll meet: Thursday Nights, Jan 10 - Feb 28, 2019. Please note: we will not meet on Valentine's Day and the last class will be held on Wednesday, March 6. All classes meet from 7:30 - 10pm. Tuition: Before Nov 30, tuition is $315 for new players and $280 for returning players. After Nov 30 tuition is $365. or $330 for returning players. A few sliding scale spaces available. Please ask if you need a payment plan. Tuition is refundable minus a $50 registration fee if you cancel by Dec 10. This workshop is for returning players who would like to delve deeper into exploring the exciting theatrical possibilities in Viola Spolin’s Improvisation for the Theater. Our last session will be a workshop performance/demonstration and a potluck reception for an invited audience of friends and family on Saturday, May 4th. Tuition: $250. before Dec 15, $265 after. A few sliding-scale spots are available. Payment plans ok. Tuition is refundable minus a $50 registration fee if you cancel by February 16. Enter the holiday season refreshed and inspired! In this three-hour workshop, we’ll explore the theater games and exercises that inspire theatrical improvisers to get out of the head and into the present time, but without any expectation of performing or being “on.” Our goal is to experience the many benefits of spontaneity and group play, with no pressure to create scenes or act. We’ll play a combination of meditative warm ups, sensory-awareness exercises, and traditional children’s games to release the intuition and open up new avenues of personal expression and communication. No experience needed, just a willingness to play! Tuition: $365. ; Returning players rate is $330. A few sliding scale spaces available. Please ask if you need a payment plan. Tuition is refundable minus a $50 registration fee if you cancel by Dec 10. Alumni Theater Game Workshop. We’ll meet for 8 Tuesday nights, March 12 - April 30, plus a workshop demonstration/performance for an invited audience on Saturday, May 4th. Mid-Wilshire location. Open to returning players only. Tuition is $380. Improvisation to Develop a Solo or Ensemble Show. We’ll meet for seven Thursday nights, March 14 to April 25th, plus a final meeting on Saturday, April 27th, which will be a performance of our works-in-progress for an invited audience. NoHo location. Players will create and develop a monologue or personal story with the goal of beginning a longer piece. Teams of players who would like to develop an ensemble show are also encouraged to participate. All experience levels welcome. Tuition is $375 for new players and $340 for returning players. Weekend Spolin Intensive in North Hollywood March 16 & 17th, 2019. Tuition is $265. Sidecoach Aretha Sills is the granddaughter of Viola Spolin. She studied theater games for many years with her father, director Paul Sills (creator/director of The Second City and Story Theater), and has conducted workshops for Paul Sills’ Wisconsin Theater Game Center, Bard College, Stella Adler Studio of Acting, Stockholm International School, Sarah Lawrence College, and Northwestern University. She has worked with Tony- and Emmy-Award winning actors and has trained faculty from Northwestern, DePaul, Columbia College, The Second City, The Alan Alda Center for Communicating Science, LAUSD, CETA, and many other institutions and schools. She is the Associate Director of Sills/Spolin Theater Works and she directs The Predicament Players. 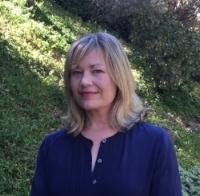 She received her MFA in Creative Writing and Writing for the Performing Arts from UC Riverside where she also taught as a lecturer in creative writing. Her non-fiction, fiction, and poetry has been published in Los Angeles Review of Books, Qua, Calyx Journal, and South Bank Poetry Review. Explore the improvisational acting method of Viola Spolin to enhance your training as an actor, improviser, educator, writer, or director. Named “one of the most prominent acting techniques” by Backstage, Viola Spolin’s Theater Games release the intuition through focus, spontaneity, and play, opening up new avenues of expression and communication in your work and in your daily life. Designed to introduce the key principles of Spolin's revolutionary acting, directing, and teaching methods in two days, the weekend intensive will help players be more fully present onstage and off. Beginners and experienced players are welcome. We'll meet: Saturday and Sunday, Oct 27 & 28, 2018, from 10am to 4pm, with an hour lunch break at 1pm. Tuition: $265. A few sliding-scale spots are available. Payment plans ok. Tuition is refundable minus $50 deposit if you cancel by Sept 27. Registration: Email with questions if needed. To be added to the waiting list, please fill out the form found here. I will reply to confirm your spot on the list. We'll meet: Saturday and Sunday, November 10 & 11, 2018, from 11am to 5pm, with an hour lunch break at 2pm. Tuition: $265. A few sliding-scale spots are available. Payment plans ok. Tuition is refundable minus $50 deposit if you cancel by Oct 10. Registration: Email with questions if needed, then please fill out the registration form found here. I will reply with payment info. Designed to introduce the key principles of Viola Spolin's revolutionary acting, directing, and teaching methods in two days, the weekend intensive will help players be more fully present onstage and off. Beginners and experienced players are welcome. We'll meet: Saturday and Sunday, Jan 12 & 13, from 11am to 5pm each day, with an hour break for lunch at 2pm. Aretha Sills is the granddaughter of Viola Spolin. She studied theater games for many years with her father, director Paul Sills (creator/director of The Second City and Story Theater), and has conducted workshops for Paul Sills' Wisconsin Theater Game Center, Bard College, Stella Adler Studio of Acting, Stockholm International School, Sarah Lawrence College, and Northwestern University. She has worked with Tony- and Emmy-Award winning actors and has trained faculty from Northwestern, DePaul, Columbia College, The Second City, The Alan Alda Center for Communicating Science, LAUSD, CETA, and many other institutions and schools. She is the Associate Director of Sills/Spolin Theater Works and she directs The Predicament Players. To be notified about upcoming workshops, or to inquire about workshops for your school or group, please email. Learn about our new youth theater workshops in Los Angeles here. Announcing Our New Youth Theater Program in Los Angeles! We are excited to announce our new youth theater program! Generations of kids and adults have learned to act through playing Viola Spolin’s improvisational theater games, among them Oscar and Tony-Award winning actors and directors. Sidecoach Aretha Sills invites young players to explore the play-based method that allows each child’s unique gifts to flourish in a non-competitive, nurturing, and joyful environment. Students of all experience levels are welcome, including aspiring actors and those who just wish to play! Six-Week Theater Game Workshop for Ages 7 – 11. Starts February 3, 2018. Children aged 7- 11 will be introduced to acting fundamentals through a series of games and exercises designed to unleash creativity through spontaneity, focus, and play. Young actors will develop the sensory awareness and communication skills needed on-stage and in daily life in an encouraging and joyful environment. The workshop culminates in an improvised demonstration/performance for friends and family, allowing players to gain on-stage experience while having fun. Players of all skill levels are welcome in this workshop. See below for location, tuition, and registration info. We’ll meet: Saturday mornings, February 3 through March 10, from 10:30am to 12pm. Six-Week Theater Game Workshop for Ages 12 – 17. Starts February 3, 2018. Teens aged 12- 17 will be introduced to acting fundamentals through a series of games and exercises designed to unleash creativity through spontaneity, focus, and play. Young actors will develop the sensory awareness and communication skills needed on-stage and in daily life in an encouraging and joyful environment. The workshop culminates in an improvised demonstration/performance for friends and family, allowing players to gain on-stage experience while having fun. Players of all skill levels are welcome in this workshop. See below for location, tuition, and registration info. We’ll meet: Saturday afternoons, February 3 through March 10, from 1pm to 2:30pm. FOR LOCATION, TUITION, AND REGISTRATION INFO, VISIT HERE! Two Los Angeles Workshops Starting in January 2018! Viola Spolin and Paul Sills, and on applying Spolin's meditative methods to your work in any artistic discipline. In the ten-week alumni workshop, open to returning players only, we'll delve deeper into "Improvisation for the Theater," playing some of the many wonderful theater games we don't always get to in an introductory workshop. 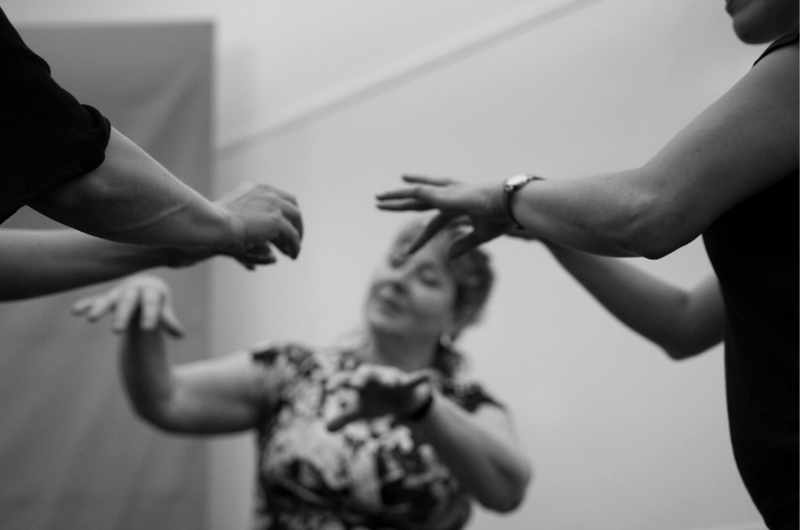 The workshop culminates with a performance/demonstration and reception for an invited audience, allowing players to develop performance skills in a welcoming environment. We'll meet: Tuesday nights for nine weeks, January 16 - March 13, 2018, 7:30 to 10pm. Please note: the workshop demonstration and party will be on Wednesday, March 21st, from 7:30 to 10pm. A deposit of $150 is required to hold your space with the remainder due at the first class. I accept checks, Venmo, or PayPal, and am open to payment plans. Early-bird pricing: $340 for payments made in full by Venmo or check only. Special pricing ends November 16. Refund Policy: Tuition is refundable minus $50 if you cancel by December 16. Registration: Email with questions or to register. 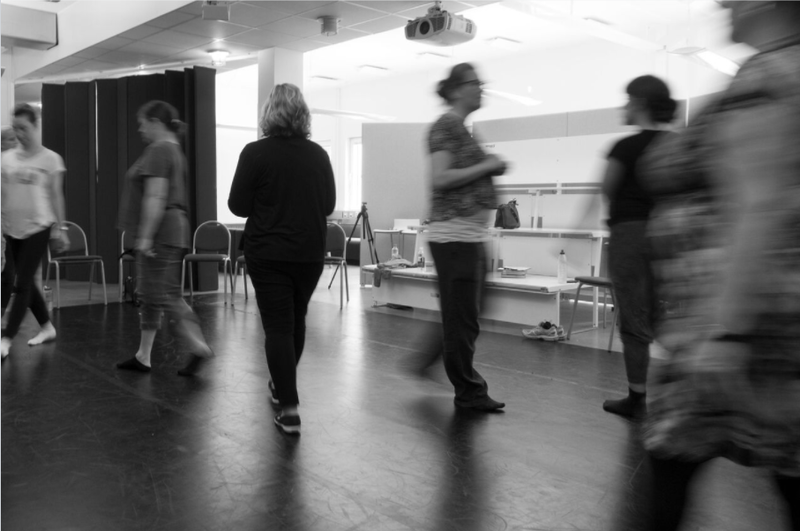 The weekend Spolin improvisation intensive is an accelerated version of a longer introductory workshop. Actors, educators, directors, and improvisers learn (through play) how to incorporate Viola Spolin's transformative techniques into their practice. Workshops are open to beginners and experienced players. The intensive will introduce players to the the key principles of Spolin's acting, directing, and teaching methods, and help you be more fully present onstage and off. We'll meet: Saturday and Sunday, January 20th and 21st, 2018, from 11am to 5pm, with an hour lunch break at 2pm. Location: The fanaticSalon Studio Space, 11306 Venice Blvd, Los Angeles, CA 90066Tuition: $250. A deposit of $125 is required to hold your space, with the remainder due by the first class. I accept checks, Venmo, PayPal, and I am open to payment plans. A few sliding scale spaces are available. Early-bird Pricing: $225 for payments in full made by Venmo or check only. Special pricing ends November 20th. Refund Policy: Tuition is refundable minus $50 if you cancel by December 20. Aretha Sills is the granddaughter of Viola Spolin. She studied theater games for many years with her father, director Paul Sills (creator/director of The Second City and Story Theater), and has conducted workshops at Paul Sills' Wisconsin Theater Game Center, Bard College, Stella Adler Studio of Acting, Stockholm International School, Art of Acting Studio, Sarah Lawrence College, and Northwestern University. She is the Associate Director of Sills/Spolin Theater Works and directs The Predicament Players. Aretha was nominated for an INNY Award for Best Improvisation Instructor and was the keynote speaker at the California Educational Theatre Association conference. Fall 2017: Weekend Spolin Improvisation Intensives in the Bay Area and Seattle in November! BAY AREA WEEKEND SPOLIN IMPROVISATION INTENSIVE NOVEMBER 11 & 12! Explore the improvisational acting method of Viola Spolin to enhance your training as an actor, improviser, educator, writer, or director. Viola Spolin’s Theater Games launched the American improvisational theater movement and changed the way acting is taught. Her work has influenced generations of actors and educators. Called "one of the most prominent acting techniques" by Backstage, Spolin's Theater Games release the intuition through spontaneity and play, opening new avenues of expression in your work and in your life. 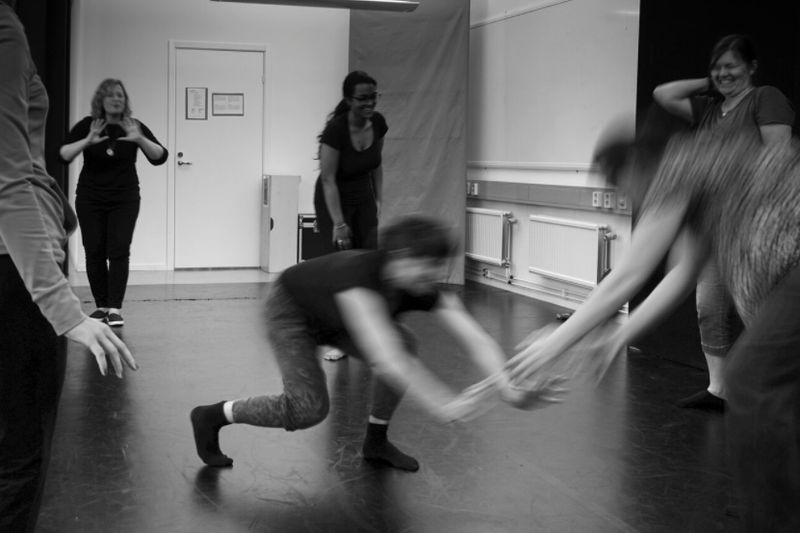 In the weekend intensive with sidecoach Aretha Sills, we will explore the groundbreaking exercises and theatrical concepts found in Spolin's Improvisation for the Theater. Workshops are open to beginners and experienced players. We'll meet: Saturday and Sunday, November 11th & 12th, from 10am to 4pm, with an hour lunch break at 1pm. Tuition: $250. A few sliding-scale spots are available. Full tuition is required to hold your space, which is refundable (minus a $50 deposit) if you cancel by October 11. I accept checks or PayPal. Please ask if you need a payment plan. SEATTLE WEEKEND SPOLIN IMPROVISATION INTENSIVE NOVEMBER 18 & 19! 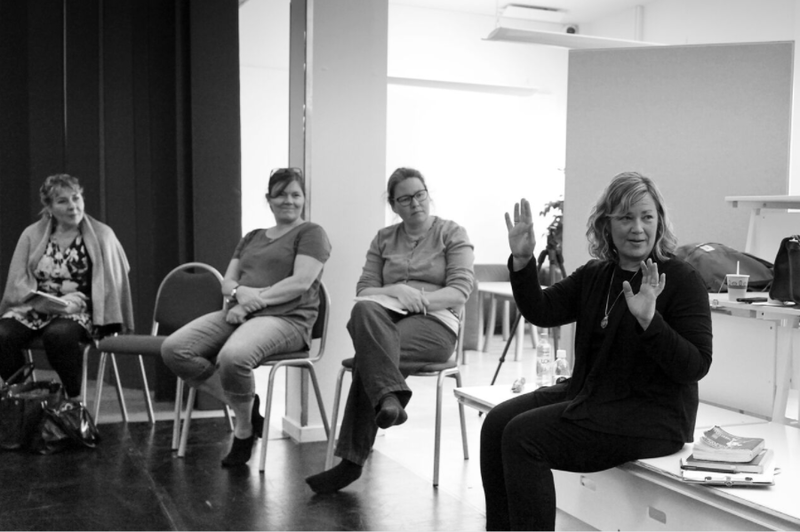 The intensive, side-coached by Aretha Sills, is an accelerated version of an introductory theater games workshop. 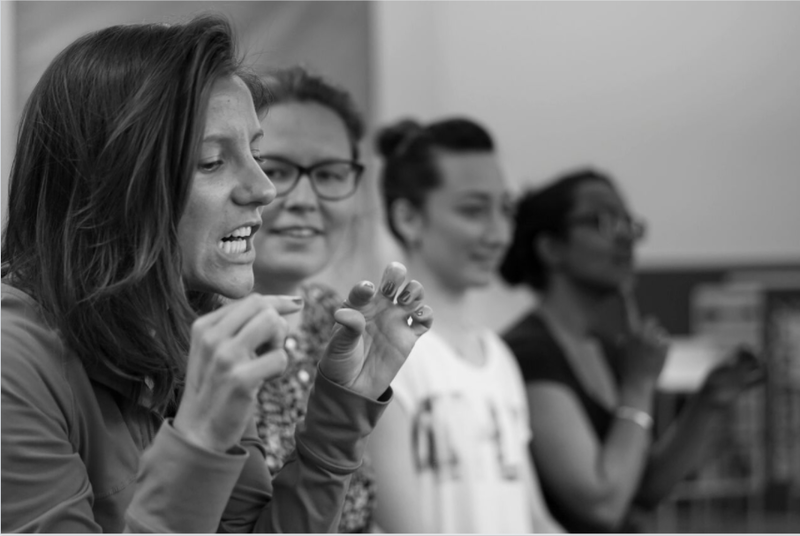 Actors, educators directors, and improvisers learn (through play) how to incorporate Spolin's transformative techniques into their practice. 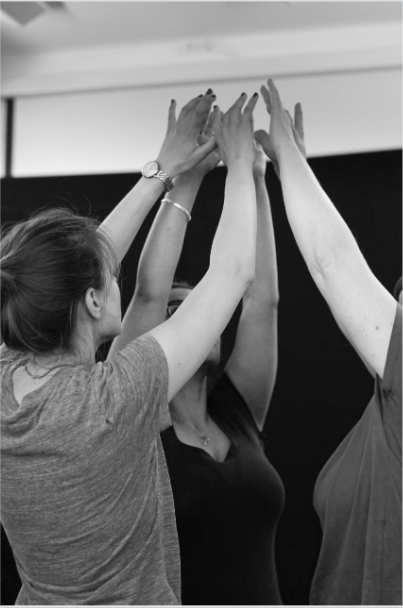 Workshops are open to beginners and experienced players and are designed to help players be present onstage and off. Location and Registration info: The intensive is being presented by Unexpected Productions and will take place at their theater in Pike's Place Market. Find details and registration info here. Spring 2017: Weekend intensives in Los Angeles, New York, and Chicago! Explore the improvisational acting method of Viola Spolin to enhance your training as an actor, improviser, educator, director, or to experience more play in your daily life. Viola Spolin’s theater games launched the modern American improvisational theater movement and changed the way acting is taught. Her work has influenced generations of actors and educators. 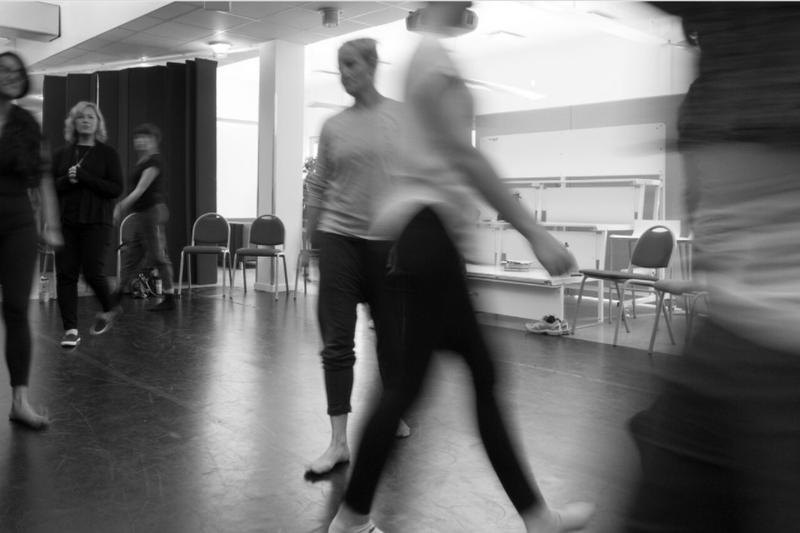 In the weekend workshops we’ll explore the groundbreaking exercises and theatrical concepts found in Spolin’s groundbreaking book Improvisation for the Theater. Open to beginners and experienced players, the intensives are designed to help players be present onstage and off. Improvisation for Writers Starts January 11th in Los Angeles! to see where it leads without judgment. Based on the work of Viola Spolin, author of Improvisation for the Theater and mother of the modern American improvisational theater movement, the workshop will explore ways writers can access their intuition through play to bring a fresh spontaneity to all types of written work. This ten-week workshop is open to beginners and experienced writers and players. Ten-Week Viola Spolin Theater Game Workshop iN LOS ANGELES Begins January 14, 2017! Viola Spolin’s theater games launched the modern American improvisational theater movement and changed the way acting is taught. Her work has influenced generations of actors, directors, and educators. 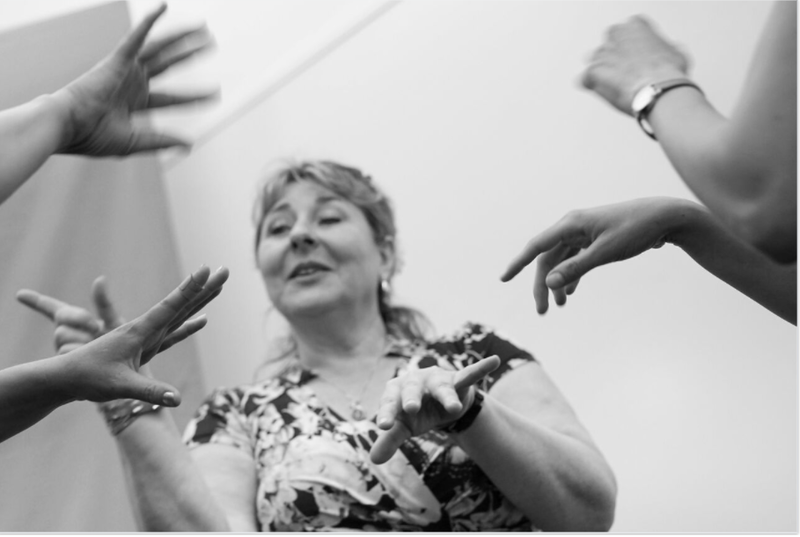 Explore the transformational theater games of Viola Spolin to enhance your training as an actor, improviser, educator, director, or to experience more play in your daily life.